People have different names for pergolas; some call it a patio, gazebo, outside deck and pent. No matter what you call it, they are beautiful and are meant to serve as a recreational spot for families. These garden structures are considered as an extension of the house. 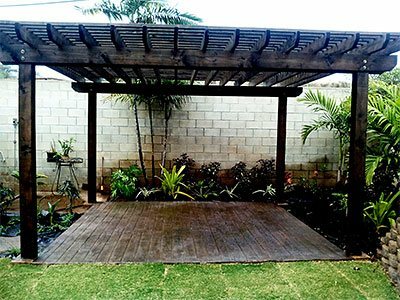 If you are looking to have a place in your garden to sit and enjoy the colorful flower, birds and lush greenery then building a pergola is ideal. Some people spend more time in their patio than they would inside their homes. If you have a beautiful garden to enjoy then why not spend time outdoors? If you have a pergola, you should make it even more interesting by adding the right patio furniture and ambience to make it interesting and aesthetically pleasing. There are hundreds of choices to build a beautiful gazebo. For example, you can have a metal pergola or you can have a wooden one, concrete or even plastic. The choice is ultimately yours as to which one you would prefer. The bottom line is, pergolas are a great feature to have in your home garden. You can place the right outdoor furniture to make the space comfortable, attractive and functional. You never have to lift a finger to design and install your pergola, as we at Unlimited Landscape Hawaii LLC can do it for you. Call us today on 808-726-9495 and speak to our friendly and professional staff today to find out how we can help you get a dream garden.